A story of a true Gandhian among the Nagas whose contribution for the well being of the society has been immense and her life reflects the true essence of womanhood. 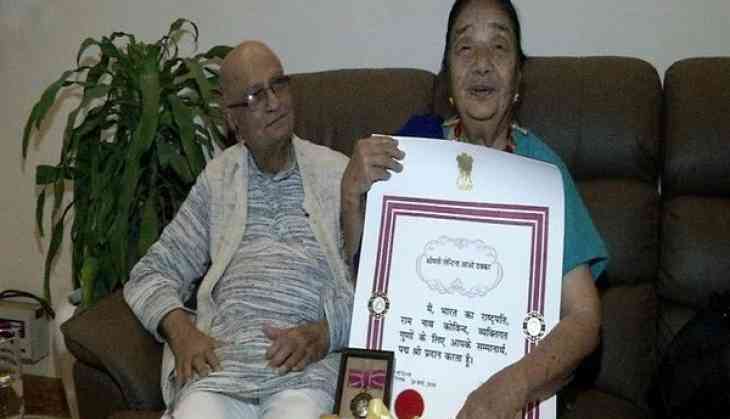 Eighty four-year-old Lentina Aao Thakkar from Merakong village in Mokokchung district of Nagaland is the first woman who trained to be a Gandhian. Recently, she was awarded the Padma Shri for her incredible work of 68 years as a social activist at the Kasturba Gandhi Ashram in Guwahati. ANI had a quick chat with this Padma Shree awardee . Utsu or grandmother as she is popularly known shared her journey. How do you feel receiving such prestigious award after years of struggle and compromise? My entire life I have worked for the welfare of the people and never expected that I will receive such an award in my life. I feel good working for people, but it gave me immense pleasure when I came to know that the government has announced my name for Padma Shri . It feels amazing. Being the only Naga woman who has been trained in the Gandhian way of social work and belonging to a small village in Nagaland, enlighten us about your childhood and your education? Although, I belong from a modest village, my father always encouraged me as he was a teacher himself. During those days, formal schooling served no special purpose and girls were not allowed to go to school. Only boys of our village used to go to school. But my father was always keen to enroll me in school. A missionary school was established by the Christian community at our place and I, along with few girls, use to go to the school and studied initially till standard II. I have studied in three places- Merakong, Chuchuyimlang and Mokokchung. I was the first woman to study till standard Seven in our village. Tell us about your journey with the Kasturba Gandhi Ashram? After passing out of seventh standard, I went to the Kasturba Gandhi Ashram in Guwahati. My elder brother was a teacher those days and he arranged for me to move to Guwahati for training as a social worker and midwife at the ashram in 1950. I never thought that I will work for society. I always followed the path shown by my brother. Although I met many kind people in the ashram, Amal Prabha Das, Gandhian and the founder of Kasturba Ashram helped me to learn Assamese as I was not fluent . She helped me translate English to Assamese. Besides this, I was trained in kitchen work, hand weaving etc. Life was not so easy, it was full of hardship. Reflect upon the kind of work you did for the welfare of people? Utsu tell us about your journey as a social worker? During those days, Nagaland was part of Assam and soon militants ordered all sevikas to leave the village and the situation was not good. Although, we had thatched schools, but the villagers helped us a lot. I decided to run it by myself. I did all the work, with some support from local, untrained helpers. I didn't even have time to finish my meals and all day long I used to walk from one village to the next to attend to needy women and children.I used to travel to far-flung areas to assist pregnant women, including providing basic medical aids. The central government use to support us financially. How did you meet Nattwar Bhai Thakkar, a noted Gandhian himself? Before I started running my own gram seva kendra, my husband (Natwar Thakkar) was already settled in Chuchuyimlang and had established the legendary Nagaland Gandhi Ashram in 1955. We were not known to each other, but gradually started knowing each other as we also share the same Gandhian ideology and way of social work. When I use to travel to far flung areas to assist pregnant women and to attend to the underprivileged, he used to come along with me. Soon after, me and Natwarbhai decided to get married. It was not an easy affair in the prevailing situation of 1950's as those days' secessionist forces were powerful. But despite all odds, my mother finally agreed to our marriage and we decided to be together. He has been a pillar of suppport throughout my life. Despite old age now, Utsu's never dying attitude and social work still continue to motivate her. Her success story is an inspiring tale for many as it took a woman of extraordinary fortitude and courage to embrace Gandhi and his ideology and apply it to her work in the service of society.